I know that sending your first child into primary school can be an emotional experience- not just for your child, but for you. Moms, if you feel the urge to cry because your baby is going out into a big, new and strange world, it is perfectly fine. I think sometimes we moms cry and fret more when our children have to embark on a new phase in life. Cry all you want but try not to let your child see your tears. What he needs most is to know you are 101% confident and positive that he will just fly in school. Your joy and encouragement will be his strength. 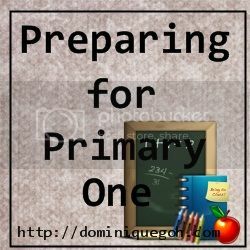 Because there are just so many new activities and experiences unique to primary school life, you may very quickly find that you don’t exactly know what is happening in school, with your child or even what to expect next. However you should also know that you don’t have to walk this journey alone. Your child’s teachers will be a great asset and help on this new journey. So I would like to share some tips on how you can partner your child’s teachers more effectively. #1:Make the form teacher your greatest ally. She holds the primary key to helping you understand what school and classroom expectations are of your child. If you need to know what your son is up to during recess, or why he didn’t bring home his new pencil case, your best bet is to ask the form teacher. But because teachers can be very busy people, you want to be sensitive and not appear like a kiasu bloodhound with your concerns. So how do you get your teacher to be your ally without getting on her nerves? #2:Ask the teacher for her preferred communication mode and best times to contact her. By asking the teacher what is the best way you can contact her to clarify concerns , you are showing the teacher that you are aware of her busy schedule and are considerate of her time. It also gives you the best shot at getting the answers you need. #3: Provide the teacher with your preferred contact details and times as well. This helps you avoid the unpleasant cat-and-mouse chase with teachers when important issues crop up. #4: Be polite and professional at all times – even when you are upset and feel you have every right to be. Let’s face it. School days will have many great days but also totally terrible ones. And there will be times that you may feel your child’s teachers have failed in their duties. Even then, please remember to keep your emotions in check while communicating with the teacher. Do always give the teacher the first opportunity to explain herself and her actions instead of running to the Head of Department, Principal or Ministry of Education. Unless you feel that your communication with the teachers are non-productive after several attempts, and you need more help from the school, then approach the school management like the HODs, Vice-Principal or Principal. Here is a suggestion on how you can deal with unpleasant situations that involves a teacher or your child in school. Scenario: Child comes home and complains that his teacher scolded him for something he did not do and for calling him ‘naughty’. You feel you must talk to the teacher. How should you approach the teacher? Just be aware that 6 and 7-year-olds do not always have the right vocabulary to describe situations and emotions fully. #5. Be willing and open to feedback- positive or otherwise. This is probably one of the most challenging aspects of a parent’s job. It is also true for a teacher. Giving positive feedback is always the easier part of the deal since every one loves to hear the good stuff. But when the feedback about the child isn’t all that nice, it can get uncomfortable for you and the teacher. . Sometimes we may even encounter teachers who lack tact and use phrases that sound more offensive than intended. And often, we cannot help but feel like the negative behaviour of our children is a reflection of our parenting abilities. However I would like to encourage you to moderate your emotions, refrain from getting personal or defensive and try to maintain a positive attitude. f you tell yourself that the teacher has the best interest of your child at heart, it would be easier for you to distil the vital information about your child’s weaker areas that you will need to help him work on. – Ask the teacher as many questions as you need to understand your child’s behaviour e.g. How often has it been observed? When and how does this behaviour been observed? – Seek to understand the teacher’s concerns and how she is managing the child’s negative behaviour in the classroom e.g.How does she think it is affecting the child? Why does the teacher think the child is behaving in such a manner? What does the teacher expect of the child in that situation? What has the teacher done to manage the misbehaviour in those instances? – Get the teacher’s suggestions on how you can support the school’s efforts in developing the child and correcting the behaviour e.g. What can I do on the home-front ? How shall we work together to help my child improve in this area? people who will bear significant influence on your child’s life. sarah (dot) wong (at) ThePlayfulParents (dot) com. Sarah is a former public school teacher in primary school. After leaving the civil service, she has taught drama and literacy to a wide range of students from preschoolers to teens, and in diverse educational settings including schools and private education providers. She now runs a full-fledged domestic circus where she juggles her multiple roles as mom, wife, teacher, writer and edupreneur. The three males in her life keep her hands busy and heart full. Whenever sanity and time permits, she can be found at The Playful Parents. Join her in her impossibly playful missions if you believe that parenting and life ought to be full of joy! In the next installment I will feature a Q and A segment which I had with some parents.